We’ve helped Tara find this dog, but Celine is still looking for this dog. I’m looking for a shaggy, floppy ivory and medium brown Animal Alley puppy. 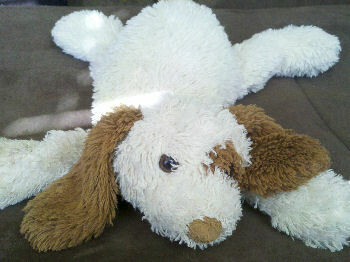 He has an ivory body with medium brown floppy ears, nose,tail and a spot on his left eye. He is lying down and has beans in his belly. He is about 15 inches long. My son received this floppy puppy when he was born in 2008, and he has been in love with it ever since. It has become his ”best friend”. His name is Woof Woof. I have even contacted Toys ‘R Us, but to no avail. There is no date on the tag – only a REG No. He takes Woof Woof everywhere he goes. My son is 2 now and, as you can imagine, Woof Woof has been through a lot. He has had a few “surgeries”, and I have even washed him (very carefully). The other day, he left Woof Woof at the grocery store. I was eventually able to find him, but that was a very bad few hours not knowing if we would be able to find him. My son was looking all over the house, calling for Woof Woof. It was heartbreaking. I know we may not be that lucky next time. I have been looking for a back up,” just in case” for the past few months. I have brought home many “impostors” but they just don’t measure up to the real Woof Woof. Any help would be greatly appreciated, as I fear Woof Woof may not make it much longer. we only seem to have imposters here in France too! There are a lot of plush dogs that do fit this general description, Anji. It’s a shame when a child can’t accept something close, but only wants the same exact lovie. Sometimes they won’t ever accept the same one if it’s not in the same condition. One mom told me she had to make the like new one we sold her “good as old”! There used to be a commercial on TV showing a mom running over a lovie and doing all kinds of things to it before giving it to her child. LOL! I had a similar with an Animal Alley toy which was bought for our youngest son Joey. We went camping and “Jakeus” was left behind. I searched all over (I still am, hence me finding your story!) but couldn’t find the same dog. In the end we found a similar match (same style and feel but different colours) and at Christmas 2010 we placed him on top of the gifts with a letter from Jakeus, delivered by Santa saying that he was having a lovely time at the seaside and that he had sent his puppy to stay with Joey. It worked beautifully and continues to do so, with the occasional “I want the black Jakeus to come home”. The search continues but “Baby Jakeus” has now become one of the family! Thanks so much for responding. That is really great advice about the letter delivered from Santa from “Jakeus”. It is so great to know that it worked because I will definitely take your lead on that if something happens to “Woof Woof” again. I don’t get why the companies that make these stuffed animals make it so hard to find them again. I would have thought that Toys R Us would have some kind of stuffed animal retirement program 🙂 Well, it is so great that there is a website like this one that we can all share our stories and hopefully help each other find the one we are looking for. I hope you find “Jakeus” ! Here is one on ecrater if anyone still needs one. Thanks so much Susan! After speaking with Susan she did find the floppy puppy for me. I am elated to have the lovey that I have been searching for and my son is just thrilled!!! Both Plush memories and Asuwishshop are great services! !